Once you open Thirst be prepared to keep reading all 336 pages to the end. Scott Harrison and co-author Lisa Sweetingham combine the art of the cliffhanger with a modern-day hero’s journey as Harrison goes from being the beloved son of devout Christians to a dissolute New York City nightclub promoter so deep into drinks and drugs that he experiences intermittent numbness before he’s thirty. Small epiphanies about the destruction left in the wake of heavy partying and even heavier drinking and drug use leads him to explore the faith he was raised in. Slow changes meet an abrupt confrontation with a very angry and even more dangerous bouncer, and that forces Harrison on a road trip that leads to a 16-month stint on a Mercy Ships’ hospital ship bound for Benin, Africa. While experiencing compassion and friendship with others who suffered in ways he’d never imagined, Harrison learns that a lack of clean water is a cause of many of Africa’s medical crises, and with that comes the first part of his life’s mission: bring clean water to people who have none. Harrison founds charity:water and finds his second mission: make giving a joyful and inspiring experience, which meant that donors not trust but know their money is going to clean water projects created by local partners and managed by local people. Charity:water directs 100 percent of grassroots donations to clean water projects, while staff salaries and similar expenses are covered by a cadre of donors who support organizational operations. Harrison learns to temper his enthusiasm by hiring, listening to, and learning from people with the financial, program management, leadership, and other executive skills he initially lacks, but his headstrong energy and commitment remains. Harrison is open about the many mistakes he and charity:water has made. Thirst is as much a story of building a nonprofit as it is Harrison’s journey to become a more caring and responsible executive, husband, and father. Thirst is also a story of the power of old-fashioned values like faith, mercy, persistence, and humility, which prevent Harrison’s natural charisma from curdling into the narcissism that’s destroyed so many other visionaries and their short-lived organizations. 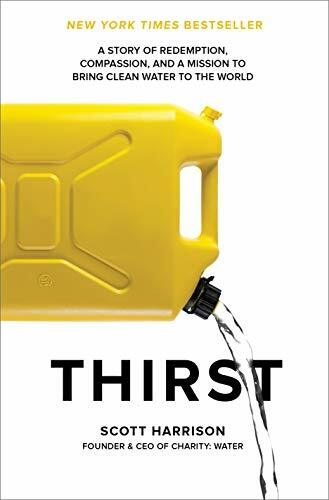 It’s hard to read Thirst and not think of a host of politically correct objections to it: a privileged white man goes to Africa, centers himself in the story of other people’s poverty, and finds personal meaning from their suffering. There’s some truth to that critique, but there’s also the truth of lives saved by charity:water. Thirst gives readers story after story of what a lack of clean water and medical care is doing to millions of people in Africa and beyond, from an unnamed four-year-old girl who vomits after drinking bacteria laden water, to the horrifying story of Letikiros Hailu, a 13-year-old Ethiopian girl deeply loved by her husband and her mother, who had to interrupt her schooling to make daylong trips over barren ground to get five gallons of water. One day, she broke her family’s clay carry pot, and whether from shame or exhaustion or both, Hailu hung herself rather than return home without water. Thirst would be a better book if Harrison were a more reflective person, just as it would be a more educational book if it explored the geopolitical issues surrounding water access or the hard lessons learned in making sure local people are equal partners in water projects. By the end of all those pages, Thirst is what it is: one man’s story of how he lost faith, found it, and changed the lives of thousands of people in the process. One of Thirst’s more poignant moments comes when Harrison finds a quiet spot during charity:water’s tenth anniversary gala (held at the Metropolitan Museum of Art’s Temple of Dendur, no less) to pray and reflect on the unexpected lessons learned on his journey from church boy to prodigal son to organizational leader and loving husband. It’s not just the cliffhangers that make Thirst a hard book to put down.